SUMMARY: Protocol on how to deal with dog-dog aggression. Aimed at a professional audience. 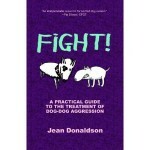 AUDIENCE: Pick this one up if you are unfamiliar with the force-free protocols for dog-dog reactivity. REVIEW: This book lacked a little meat on the bone, in my opinion. Or at least it didn’t tell me anything I didn’t know, which is a disappointment considering the author. She is a great generalist, and fabulously gifted at making abstract concepts clear to the layman, so I guess a highly focused, technical subject, isn’t her strong suit. Perhaps this book did not get away with JD’s trademark conversational prose, and needed a more structured and technical approach? I think it pretty much covered all there was to cover, but it left me feeling a little unsatisfied, somehow. An additional (but small) frustration with this book is the frequent reference to using a bomb-proof dog, when this is in clearly a very rare commodity. So, all in all, a very good summary and explanations of the protocols out there, but it’s a tad unrealistic at times. Browse the Book Review archive. Genre: professional manual. Author: Donaldson Jean. Reading Level: Professional. Star: 2. Bookmark the permalink. Post a comment or leave a trackback: Trackback URL. You are here: Home » Book Reviews » Fight!